Leak-Proof plastic & glass bottles. Quality fountain pen inks, suitable for refilling all types / brands of fountain pens that use pump or plunger type filling system. Fountain Pen Ink Color Black, Blue, Red, Green. Size : 60 ml. 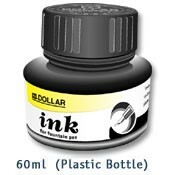 Single Bottle Price Leak-Proof plastic & glass bottles. Quality fountain pen inks, suitable for refilling all types / brands of fountain pens that use pump or plunger type filling system.